ionCube PHP Encoder is an utility from www.ioncube.com, it can encode and protect your PHP source codes. Most of the programmers of PHP have the same problem, how to protect PHP scripts souce codes, because PHP scripts source codes are simply plain text, anyone who knows how to program can possibly know Your programming logic and do things You don't want them to do. 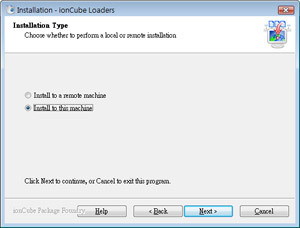 ionCube encoded scripts can not be executed without a loader, and asking Your clients to install an extra loader before they can run Your scripts is not acceptable. RaidenHTTPD is a web server with built in PHP 5 supports, and after contacting with ionCube company, we are allowed to include the ionCube loader inside our RaidenHTTPD server software package, that means with default RaidenHTTPD installation options, You will be able to execute ionCube encoded scripts directly without the need of installing another loader. 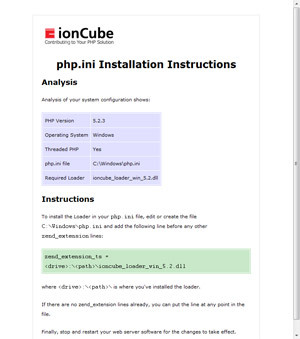 We'll guide You through the installation process of ionCube PHP Encoder in this tutorial. 1. 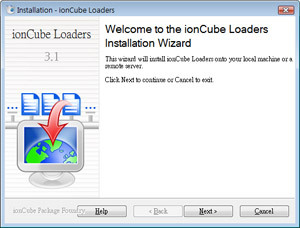 Download latest ionCube loader from http://www.ioncube.com/loaders.php, Please select Windows installer version while You download. 2. After You downloaded it, please extract it and run its setup program, such as ioncube_loaders_setup.exe, When setup screen appears, click next to continue. Select an installation folder and finish the setup. Copy ioncube-loader-helper.php from Your installation folder to Your web server's root folder, and use Your Internet Explorer to access that URL, it will tell You which loader DLL is for Your system. After modifying Your php.ini, restart the web server and try to run an encoded php to see if ionCube is enabled.